If you are in the market for a high quality 15" active speaker, then we highly recommend the RPG15. We feel this is the best value on the market. You get great features, great quality, high power, and a lot of versatility for a great price. Dimensions : 15.67" X 15.57" X 26.93"
Rockville RPG15 15" Active/Powered 1,000 Watts DJ/PA Speaker System. 250-Watt RMS / 500 Watts Program Power / 1000 Watts Peak. Frequency Response: 35Hz-20KHz. Additional balanced line output via XLR for linking of additional speaker systems. Versatile trapezoidal enclosure design allows different positioning. Flyable and stand mounting with 35-mm pole socket. Amplifier clip limit LED indicator & power LED cabinet rear. Front display power meter Blue LED. Adjustable Height. Steel Construction. Black Color. Weight capacity: 100 LBS. Adjustable Height Range: 47.25-78.75 inches. Base spread: 15-40 inches. Tube Diameter: 1.5 - 1.37 inch. Leg Diameter: 1.37 inch. Includes (2) 20 Foot XLR Female to XLR Male Cables. Includes (1) Travel Bag. 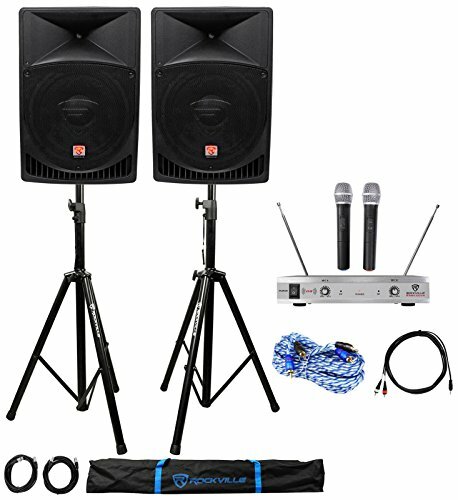 Rockville RWM1202VH VHF Dual Channel Handheld Wireless Microphone System . Improved high performance wireless handheld microphone capsule . Includes transmitter with two handheld, high sensitivity, unidirectional, wireless cardioid microphones . Featuring a dual filter design to limit feedback and interference. Ultra signal stability eliminates unwanted distortion. Transmitter automatically links to receiver for ease of use. Rockville RTR172 17 Foot 100% Copper 2-Channel Twisted Pair RCA Cable. Oxygen Free Copper. 100% Oxygen Free Copper. Premium Audiophile RCA Interconnect Cables. Split Pin Technology Ensures a Secure Connection. Outstanding Noise Rejection, Accuracy, and Frequency Response. Color Coded Channel Identification. Length: 17-Foot. Rockville 1 year warranty. Also Available in: 3-Foot, 6-Foot, 12-Foot, 20-Foot and 25-Foot. Rockville RNRMR10 3.5mm 1/8" TRS to Dual RCA Cable. Nickel-Plated Plugs for Rugged Durability and Efficient Signal Transfer. 100% Copper Conductors for Enhanced Signal Clarity. OFC Spiral Shields for Effective EMI and RFI Rejection and Flexibility. Length: 10 Ft.